WooCommerce Add-on for Analytify to bring Google Analytics eCommerce data for WooCommerce shop is finally here. And all credit goes to you, the Enthusiastic WordPress Community and user of Analytify! We always heard how people love Analytify, how it changes the way you understand your readers. Analytify always worked for all post type, and everywhere in WordPress. You get to see post by post, page by page statistics, in free or pro version. But eCommerce inside WordPress is growing in very rapid speed. Specially shining platform like WooCommerce, EDD gave it extra wings. People using WordPress to do more then blogging, or using as CMS. But eCommerce is very different, in many aspect. Its very different in Google Analytics point of view too. If you go into Google Analytics and try to setup for eCommerce you will know. Setting up goals, and tracking sales data is pretty complex. So, we heard many request why Analytify don't do anything special for shop owner. We started working quite long ago, but eCommerce is so different then just install Google Analytics code and showing data in WordPress Dashboard using API, we had to reinvent ourself. The work is done, we have our first addon “WooCommerce Addon” ready for the world. What's So Special About Analytify & WooCommerce Addon? Its different in many ways from any available solution. To give you a quick glimpse, take a look at the screenshot below, you will get a dedicated report panel inside your WordPress Dashboard with all your detail sales data, from number of transaction, revenue, how many times people added your product to the cart, how many times removed from cart and you will get detail report on product performance. And to get those you don;t have to do any complex setup in Google Analytics! Savvy? As we promise with Analytify, keeping things simple, this WooCommerce Addon also sings the same song. It's dead simple. If you run a WooCommerce Store, get Analytify, setup usual way. if you want the WooCommerce enhanced eCommerce data, get the addon, just activate it, thats ll. No extra setup on your part for the WooCommerce. The Addon does everything from setting the eCommerce setup for Google Analytics to merry it closely with your WooCommerce. You get details data, dashboard for easy access inside WordPress. You will need Analytify PRO though to use any addon. To help anybody get started we have created a bundle package that comes with Analytify PRO and WooCommerce Addon. If you are existing PRO user, contact support we will give you discount for any addon license. After you complete the purchase, you will get the addon as an zip package, just install that as a new plugin in WordPress (making sure you already have Analytify PRO installed). As described in our other blog post, activating the Addon license is pretty similar to activating the PRO. Go to Analytify -> Settings -> License tab. 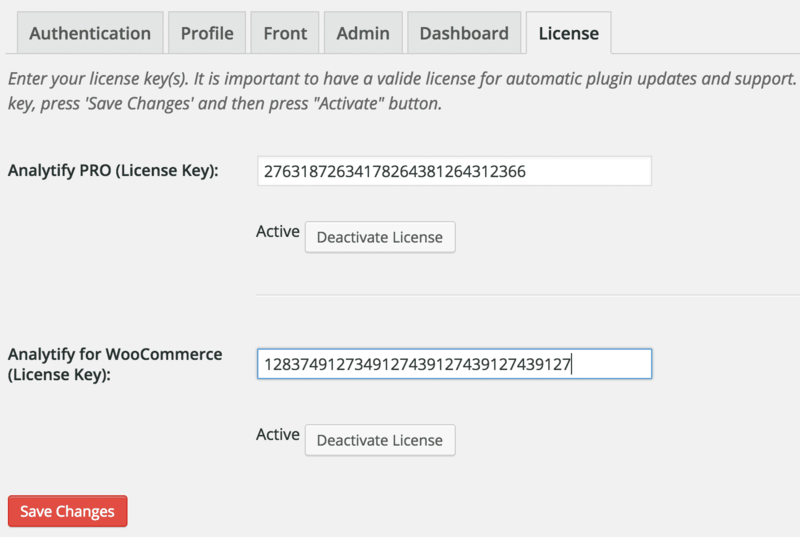 And add the license key for the specific Addon, you will get all future update in next 1 year for free. Yes, you dont have to do any setup specially for WooCommerce in Google Analytics. The configuration you have done for Analytify PRO is well enough for Addon. You will get the new report page instantly, and all future traffic and sales will be tracked. Yes, its that simple, as promised. This sounds fantastic for an upcoming install of WooCommerce. It is cheaper than Yoast’s addon and more fully featured by the sound of it.